Despite the fact that I lived in Nebraska for a good chunk of my formative years (and my first job as a doe-eyed 16-yr-old was selling Omaha Steaks), steak doesn't make an appearance in our house too often. When it does, I like to use a recipe that holds my hand a bit. The kind that will let me know what to look for and when, while guaranteeing that my efforts are worthwhile by packing a huge flavor punch. I can always count on Jaden of Steamy Kitchen to come through with a winning recipe when I'm feeling unsure. This is my new go-to sauce. 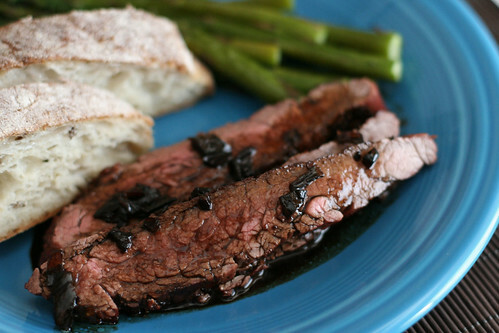 It's more balsamic than teriyaki, and it's just the right consistency and richness. A perfect match for flank steak (Jaden uses skirt steak in the cookbook, which would also be good as long as you know how to wrangle it properly, which I don't). The shallots add a bit of key texture - those are the little flecks you see in the photo. 1. To make the sauce: Add the butter to a saucepot and set over medium-low heat. When the butter just starts to bubble, add the shallots and garlic and cook for 3 minutes or until soft. Watch to make sure you don't burn them. 2. Pour the balsamic vinegar in, turn the heat up, and bring to a boil. When boiling, immediately turn the heat down to medium-low and simmer, uncovered, for 15 minutes, or until reduced by half. Add the sugar, stock, soy sauce, and mirin. Stir well and bring to a boil. When it reaches a boil, immediately turn the heat to low and let simmer for 5 minutes. Let cool. 3. To make the steak: If you're grilling outdoors (Jaden's preferred method, and mine too! ), preheat the grill for direct grilling over high heat. If you're cooking the steak on a stovetop, set a large frying pan or griddle over high heat. When a bead of water sizzles and evaporates upon contact, add the oil and swirl to coat. 4. Add the steak to the hot grill or pan in one layer. Cook for 3-5 minutes on each side for medium-rare. 5. Let the steak rest for 5 minutes, then slice across the grain. Pour the balsamic teriyaki sauce over the meat and enjoy! Yum. Looks delish. I'll have to give it a go. We love teriyaki! Be still, my heart! That looks so amazingly delicious. I'm a former vegetarian who could totally go without meat for most meals, but I LOVE a good steak. i'm sure that steak just drank the flavorful, saucy marinade right up. this looks outstanding, amy--you've done nebraska proud! Is that your potato bread in the background?!! I made that stuff and it is AMAZING! !